Madagascar hosts lemurs, fossas, aye-ayes, and a number of other species found nowhere else in the world. A magical land in the Indian Ocean, Madagascar's wildlife is unique and its forests are full of surprises. Madagascar is home to some of the unique and unusual species of wildlife in the whole world. 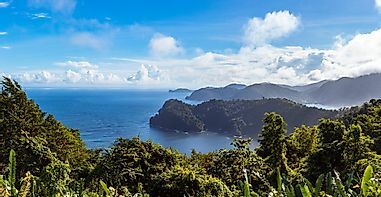 The island of Madagascar is home to almost 25,000 species of wild animals with a good number being endangered species. Some of these species of wildlife have been immortalized by cartoon films, but the real animals are far more beautiful and wonderful than what is seen in any of these movies. Most of these species found in Madagascar are endemic, meaning they cannot be found anywhere else in the world. The Madagascar fody, tomato frog, satanic leaf-tailed gecko, panther chameleon, comet moth, fossa, and the lemurs of Madagascar are some of the unique animals in Madagascar. Madagascar’s location is on the Indian Ocean to thesoutheast coast of Africa, and it’s the 4th largest island in the world. 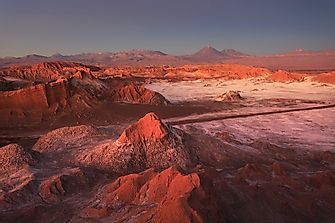 It is home to some of the unique animal and plant species not found anywhere else in the world. 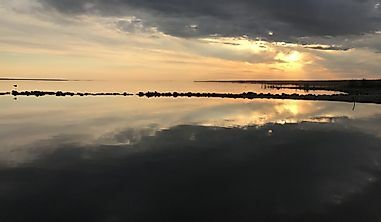 The island has been isolated for several millions of years, therefore giving the animal and plant species to evolve and diversify in isolation. About 170 million years ago Madagascar was a landlocked country within the Gondwana super continent. 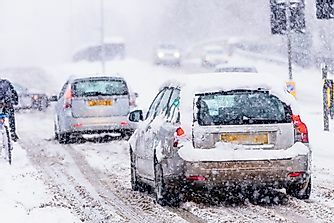 As a result of the Earth’s crust movement, Madagascar and India split from the South American and African plates and then from Antarctica and Australia. India finally broke off leaving Madagascar behind, and the island has been on its own for the past 88 million years. 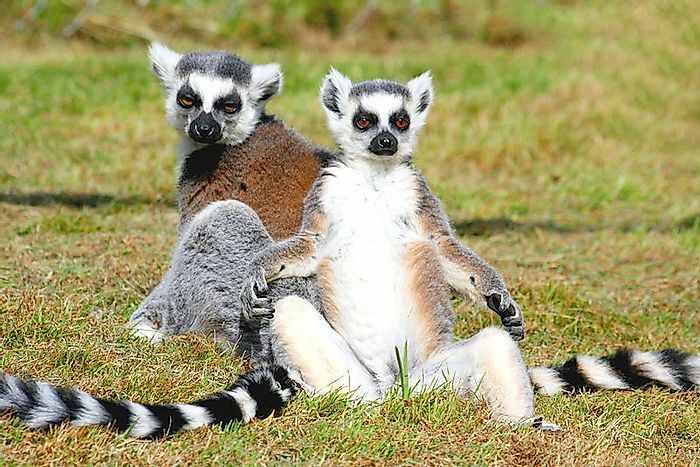 Lemurs are primates that look like an animal in between a dog, a cat and a squirrel that have incredibly unique and exciting behaviors that include singing like a whale. There are more than thirty species of Lemurs in Madagascar today that vary in size from 25 gms pygmy lemur to the largest Indri Lemur weighing more than 12 kgs. 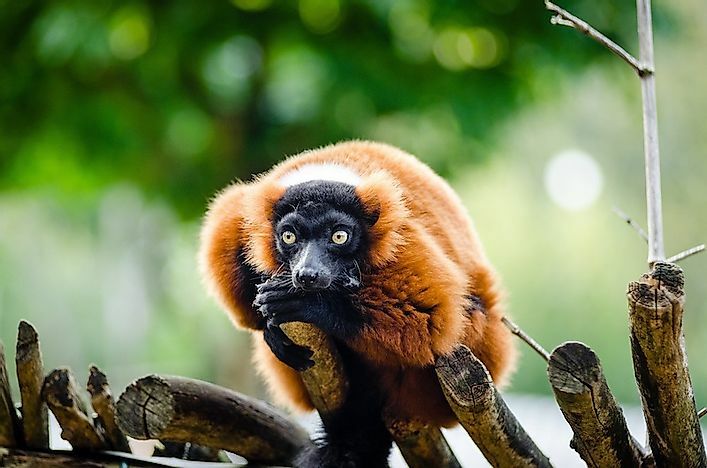 Lemurs are one of the most threatened animals in the whole planet and according to IUCN Red List of Threatened Species, 22 species of lemurs are critically endangered, 48 are endangered, while 20 are vulnerable. Fossa inhabits the forests of Madagascar and it is a close relative of the mongoose, it grows to a length of 6ft (1.8 m) from the tail to the nose and weighs up to 26 pounds (12 kgs). The animal has a slender body and appears more like a cat with little resemblance to their relative mongoose.Fossa uses it long tail like a tightrope walking pole to move swiftly through trees. 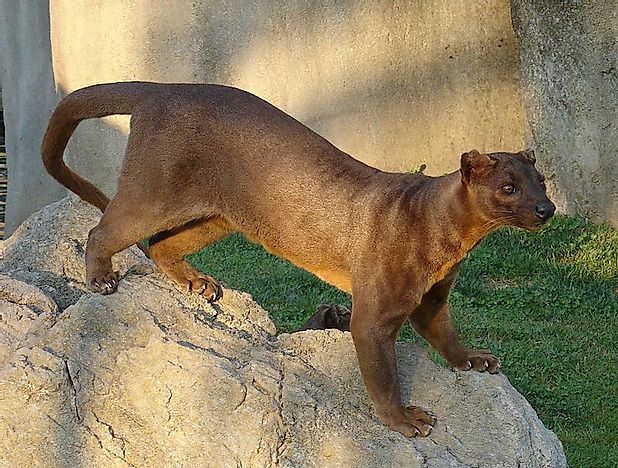 Fossa is among the endangered species and listed by IUCN Red list of thethreatened species because their habitat is diminishing. Today less than 10% of the original forest cover of Madagascar is in existence which is also the only home of the Fossa. 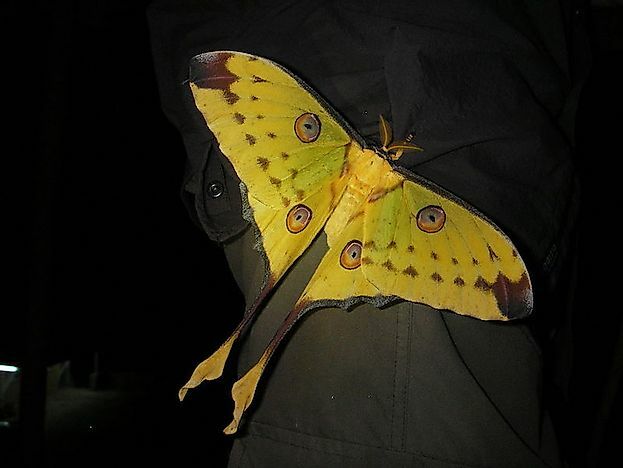 Comet moth (Argema Mittrei) or Madagascan moon moth is one of the most beautiful moths in the world found only in Madagascar. They are among the largest in the world with a wing span that extends to 20 cm coming only second after the Atlas moth of Asia. The insect has bright yellow color and with a long tail and are nocturnal. The females are broader, and their wings are rounder, their tail is also shorter than the males. To this day these beautiful animals have no protection status, and their population status has not been established. The eggs of the moth are collected for trade in the world markets. There are no known farms for these insects in the country, and their existences rely on the already protected shelters. 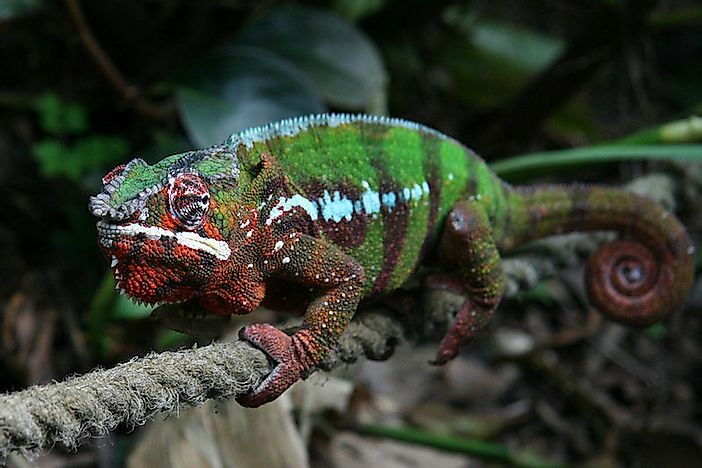 Panther Chameleon is native to Madagascar and has been introduced to other islands in the surroundings. It is one of the most colorful with widest color variations of all the chameleons, they are also larger and the most sought after by reptile keepers and traders. Like other Chameleons, panther chameleon has a bony extension on the rear part of its head called the casque. It hunts and traps its pray using its extensile tongue that has specialized muscles that propels the tongue to snare by use of sticky mucus and vacuum created by the muscles at the tip of the tongue. Satanic leaf-tailed gecko (Uroplatus Phantasticus) is a stunning reptile that can disguise itself in its environment. The body can blend and mimics dead leaves in its habitat so that it cannot be identified by its predators. 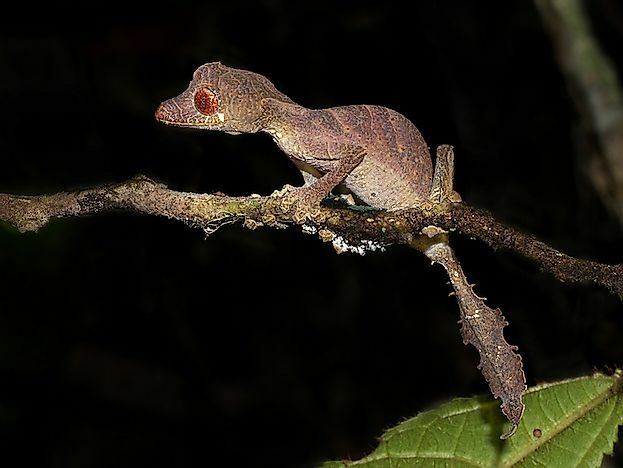 The body is twisted with a patterned skin, while the tail looks astonishingly like a leaf nibbled by insects, all these characteristics help the gecko to blend so well into the surrounding foliage. This reptilian varies widely in color, but mostly they are brownish with some spots on the underside, which distinguishes it from other similar species. Like all other geckos U. phantasticus have no eyelid but a transparent membrane that covers the eyes and use the tongue to wipe away any foreign bodies in their eyes. Satanic leaf-tailed gecko is nocturnal reptiles having large eyes that are suitable for hunting insects at night. They also have strong adhesive scales beneath their toes and fingers, and strong claws that enable their swift movements through the trees. The leaf-tailed geckos live in a particular habitat and not tolerant of any habitat that is not their natural environment. Because of its color, this gecko is a favorite pet and among the most traded species. Lately, there has been dropping in their population in the wild, and this makes it vulnerable to extinction. 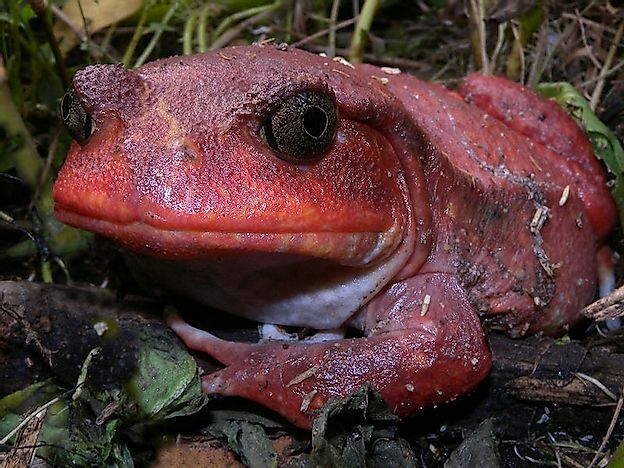 Tomato frogs are found only in Madagascar, mainly in the northwestern region of the island and are chiefly terrestrial, living in theforest areas. 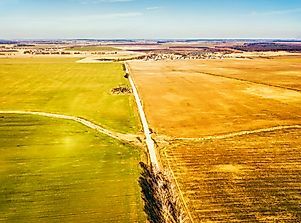 Due to deforestation, their habitat has been destroyed but seemingly they adapt well to the cultivated areas, and they are common ingardens and plantations. There are three species of the tomato frog Dyscophusantongilli, Dyscophus guineti, and Dyscophus insularis. Of the three, D.antogilli is endangered because of deforestation and its collection as pet animalit is now illegal to trade on this type of tomato frog. 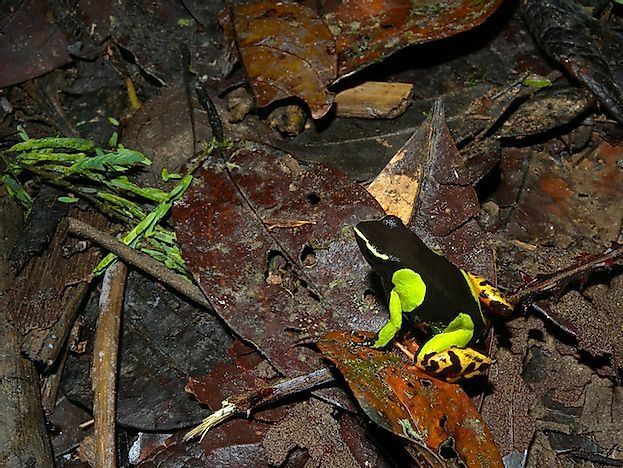 These frogs mate during the rainy season andon shallow and slow moving water. They are brightly colored and ooze off some white sticky mucus when threatened, though they are not toxic, they are irritating to the mucous membrane. 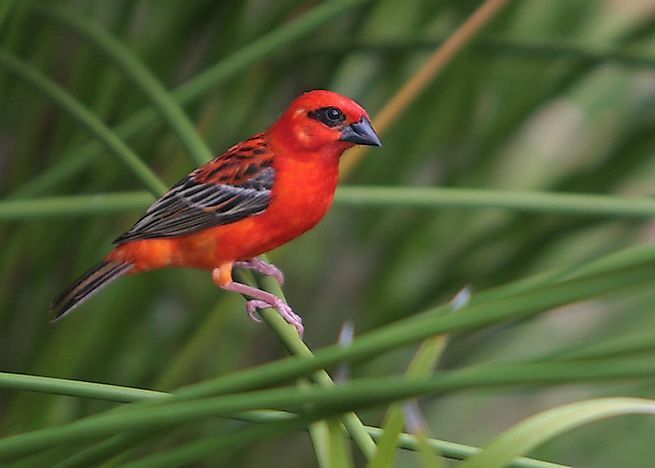 Is a bird native to Madagascar and have been introduced to other surrounding islands like Comoros, Seychelles, and Mauritius and recently the species have been spotted as far away as the Arabian Peninsula. They grow to about five inches (12.5-13.5 cm) and weigh approximately 0.5-0.7 oz (14-19 gm). The male has a bright redplumage and some black markings around the eyes and olive brown on the wings and the tail. The plumage varies widely from orange to yellowish and during mating the males undergo molting and plumage change to olive brown that look like the females. They are abundant on the island are not part of the endangered species. Madagascar hissing cockroach is one of a fascinating animal species exclusive to the island, and they are oval shaped and shiny brown insects without wings, but with a pair of antennae. The male has horns that give them a stunning appearance and use them on aggressive encounters more like the mammals. During the conflict, the roaches hiss, and that is where they got their name. 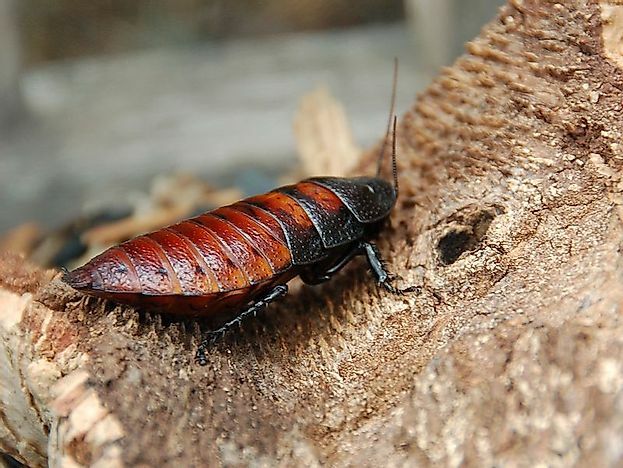 The cockroach that wins the battle hiss more than the loser and the same hissing is heard during the mating ritual. Unlike most insects which make noise by rubbing parts of their body parts together or vibrating the membranes, Madagascar cockroach amazingly uses their breathing holes by exhaling air, a behavior common to vertebrates. The insect has a life span of between two and five years and grows to between two and three inches (5-7cm) long. 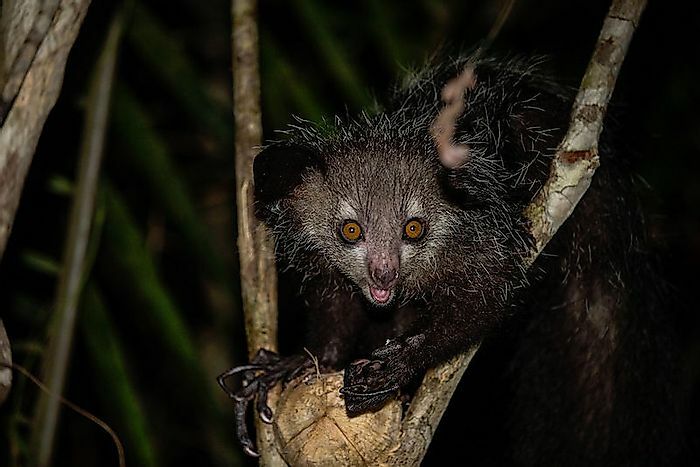 Aye-aye is a nocturnal primate living primarily on trees. Their big toes and long tails allow them to hang comfortably on the tree while they use their echolocation to find food such as insects. Aye-ayes also have sensitive big ears and eyes that help them to locate food. Because of their bizarre appearance, they have been considered as a bad omen by the locals in Madagascar. They are also considered endangered species in the country. Also called Madagascar owl is found on the islands of Madagascar. 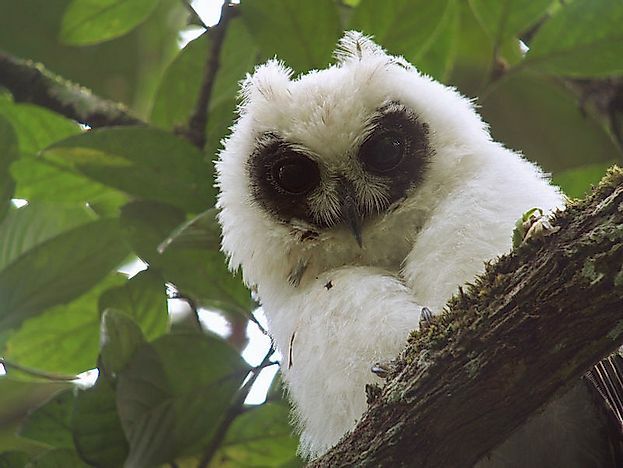 It is about 50 centimeters long making it the largest Owl in the island. The females are usually bigger than the males. Madagascar Long-Eared Owl is characterized by a brownish crown and nap on the upper part while the underneath has a black streaking. It also has a brown facial disc and dark brown ear tuff. Madagascar Owl is mostly nocturnal but mainly broods during the day. 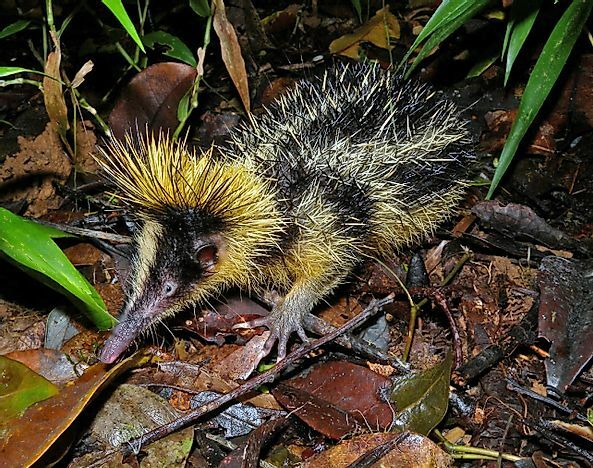 Lowland Streaked Tenrec is found in the lowland tropical rainforest of the northern and Eastern Madagascar. Lowland Streaked Tenrec has a long pointed snout, vestigial tail, and limbs. Its pelage is black with yellow stripes and bright beneath and scattered quills on its body. Lowland Streaked Tenrec is active both during the day and night and feeds primarily on insects. The long snout is mainly for poking around the ground when searching for insects. They can also feed on worms, small fishes, and even frogs. Tenrecs primarily breed in October and December depending on the availability of food. Their gestation period is 58 days, and the female can give birth to up to eight young. Scientifically known as Mantella madagascariensis, Painted Mantella is an attractive frog with green, black, yellow or orange color. The species which is grouped under common frogs is found only in East and Central Madagascar. They inhabit rainforest bordering the fresh water streams. Painted mantilla can tolerate moderate temperature between 75 to 81 degrees F during the day and slightly lower during the night. Painted Mantella is a carnivore feeding mainly on insects. The frogs are active during the day and mostly establish small territories. The bright color on the body makes it more toxic and acts as a warning for any predator in the surrounding. 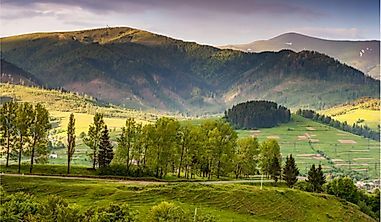 Over the past 2,000 years, the biologically rich forests of Madagascar have been reduced by almost 90% mainly through agriculture and other commercial activities like logging. This massive deforestation has pushed several of the island animals to the brink of extinction. Lemurs that exclusively inhabit Madagascar are the most endangered and has been listed on the Red List of Threatened Species. The bamboo lemur named after its choice of food is critically endangered because their habitat forest has been reduced to about 4% of the original size.